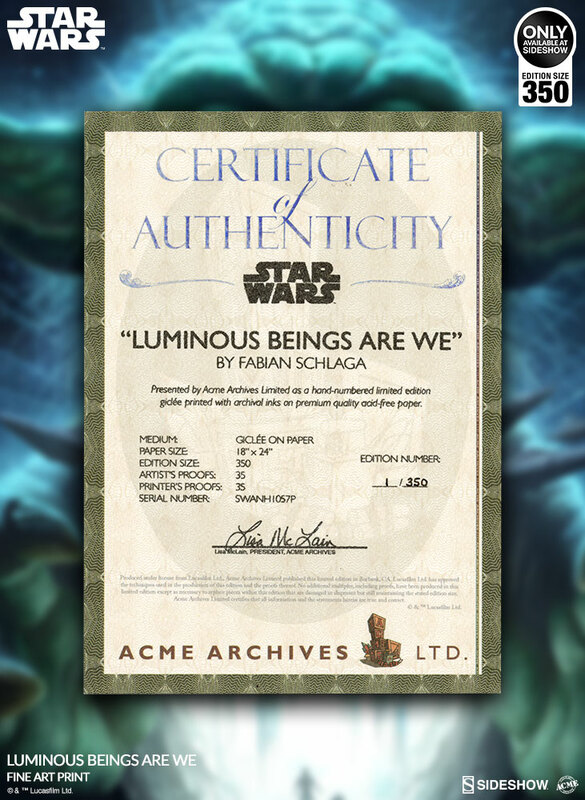 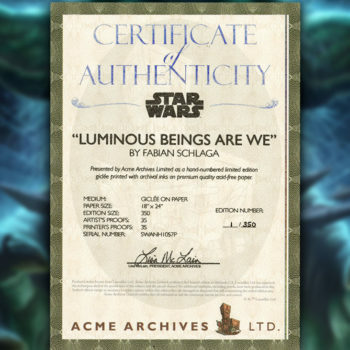 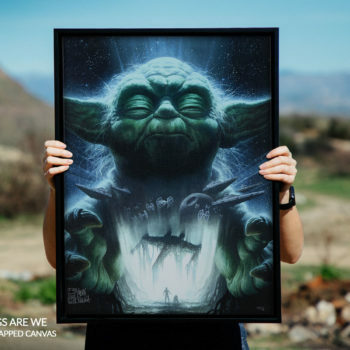 From the swamps of Dagobah, Sideshow and ACME Archives present the Luminous Beings Are We Fine Art Print by artist Fabian Schlaga. 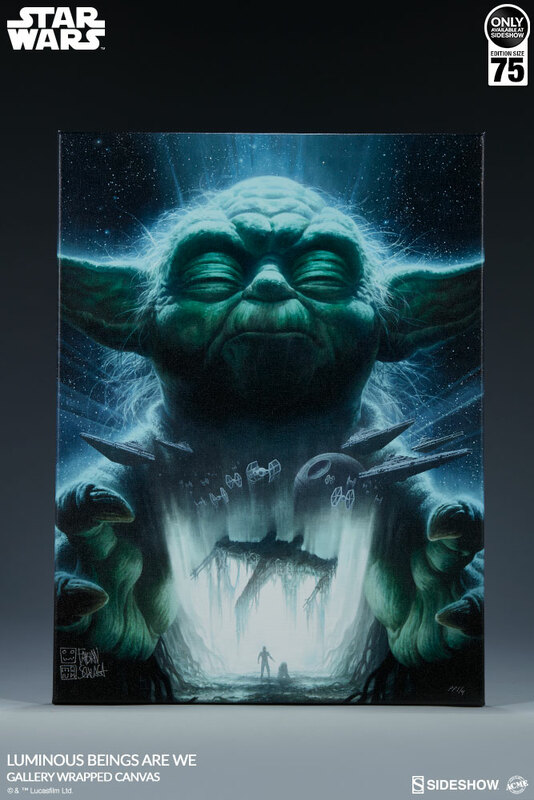 Feel the living Force throughout this breathtaking illustration of the legendary Jedi Master Yoda illuminated against a galaxy of stars. 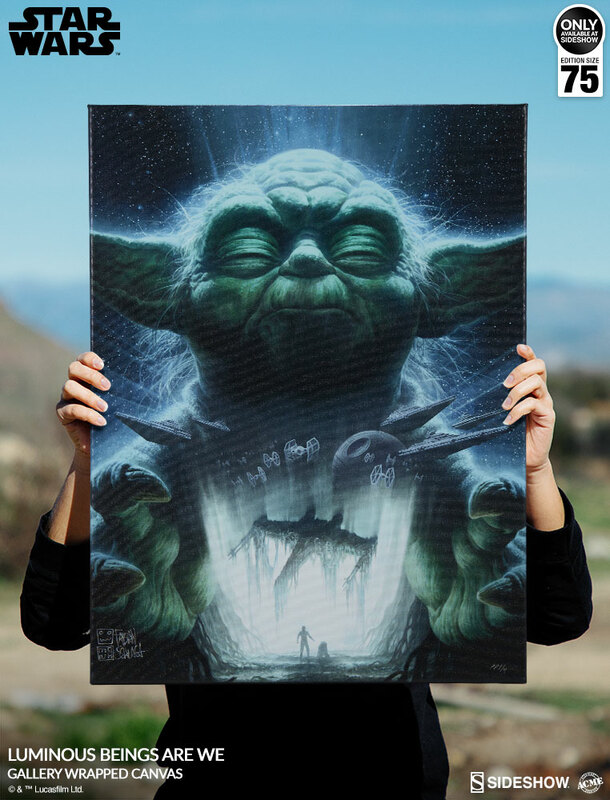 This contemplative portrait captures the immense wisdom and strength of the elderly master as he uses the Force to raise Luke Skywalker’s X-Wing from the swamps of his home world. In the galaxy beyond, the imperial legions and Death Star loom, all contained within the expansive reach of the Force. 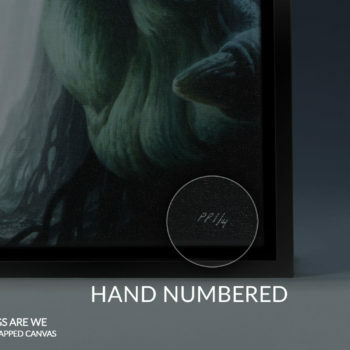 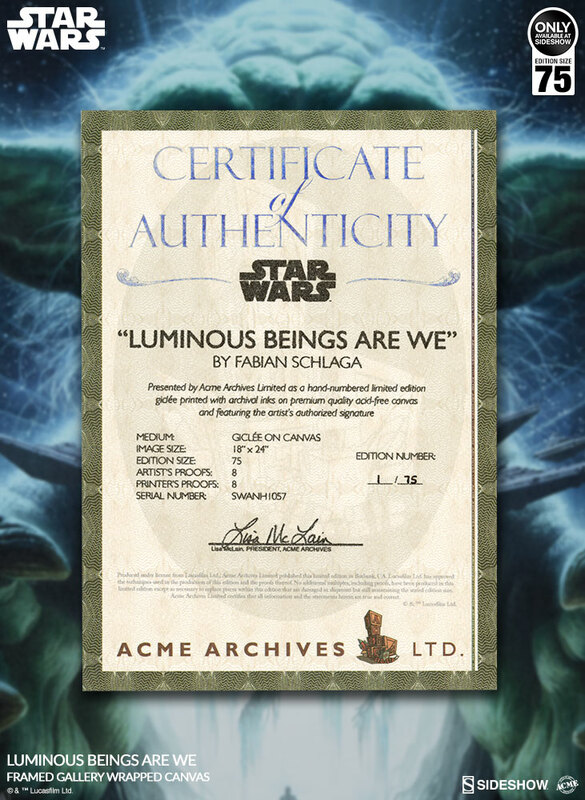 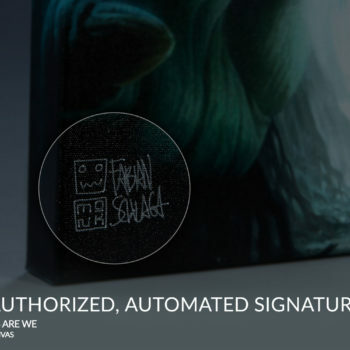 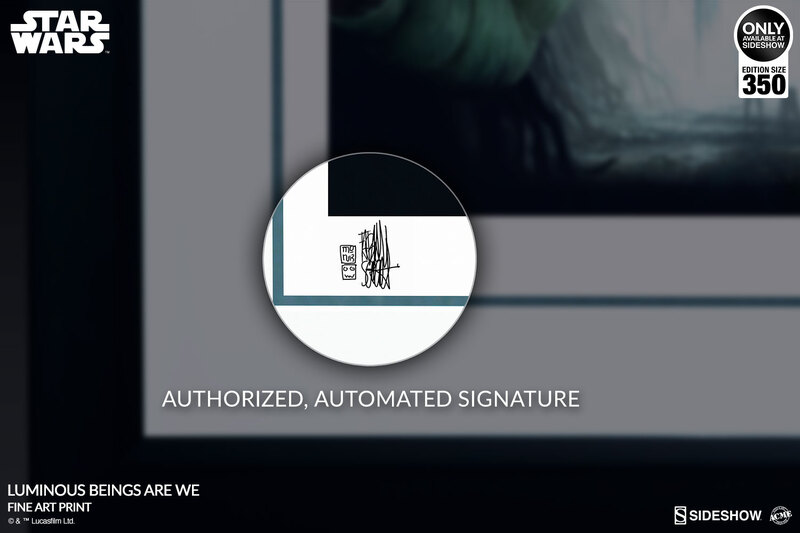 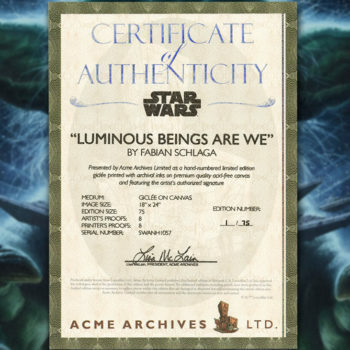 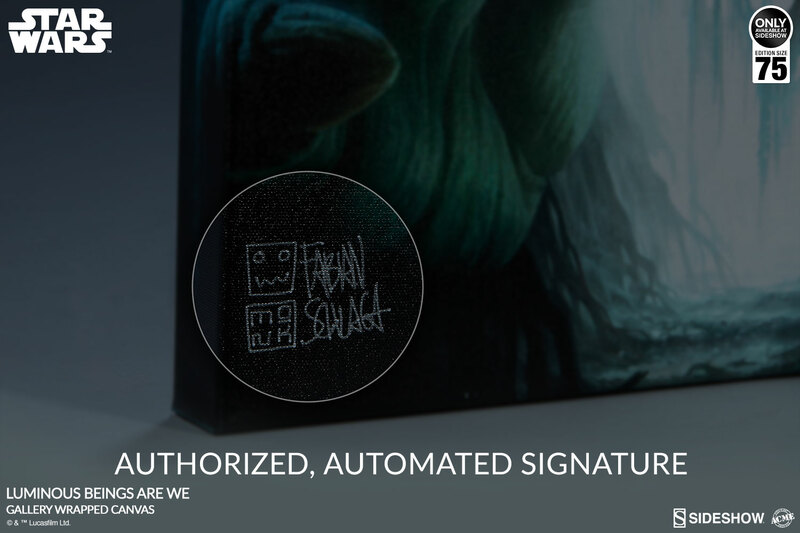 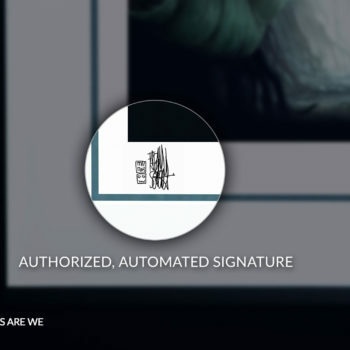 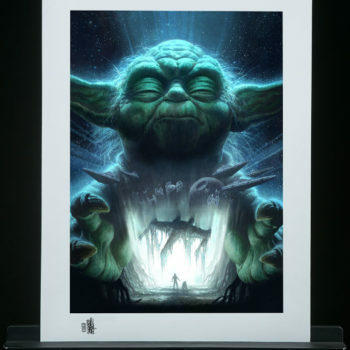 Each Luminous Beings Are We Fine Art Print features an authorized, automated pencil signature as well as a Certificate of Authenticity as a part of the hand-numbered limited edition of 350 pieces. 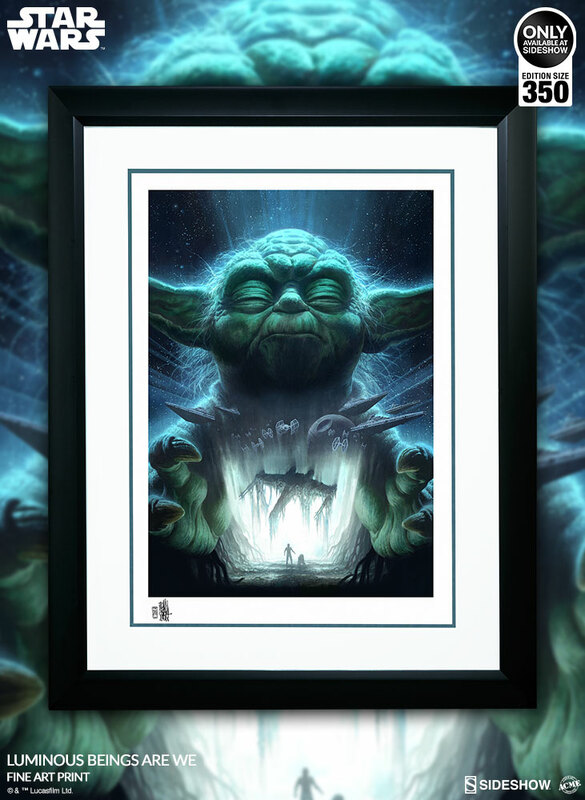 Make the Force your ally and add the Luminous Beings Are We Fine Art Print by Fabian Schlaga to your galaxy of Star Wars art collectibles today! 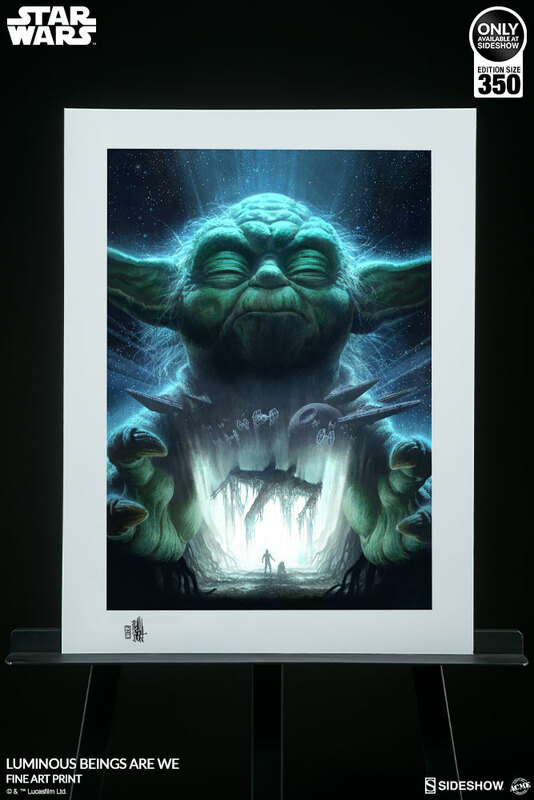 Pre-orders for the framed edition of the Luminous Beings Are We Fine Art Print will begin on Friday, February 8th between 12pm-3pm PST, and will be priced at $250 USD. 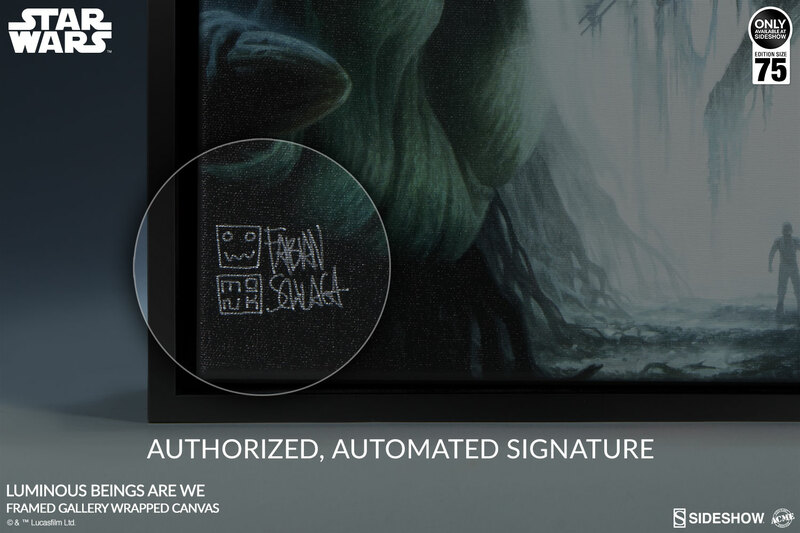 If supplies are available, unframed prints will be available for pre-order on Monday, February 11th between 12pm-3PM PST, priced at $90 USD. 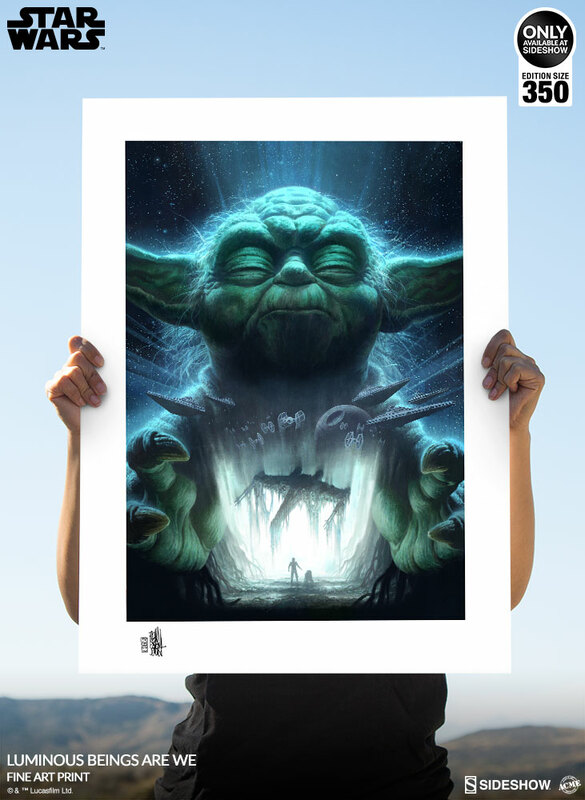 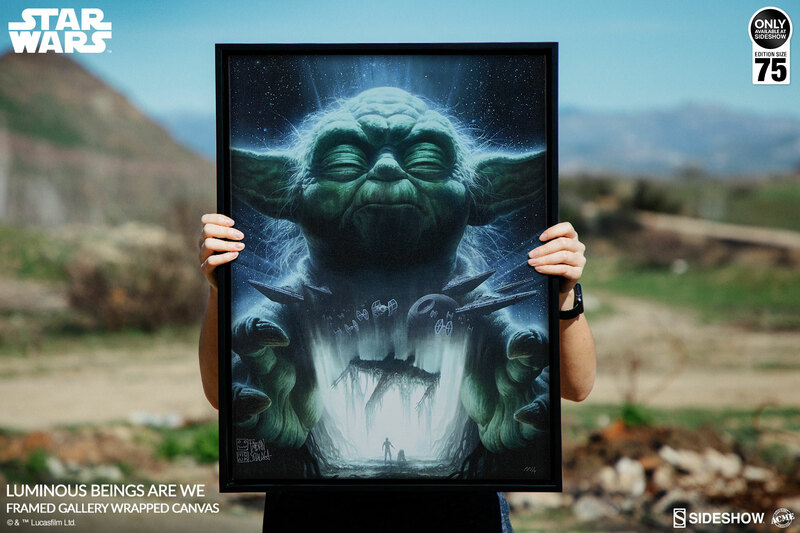 From the swamps of Dagobah, Sideshow and ACME Archives present the Luminous Beings Are We Gallery Wrapped Canvas by artist Fabian Schlaga. 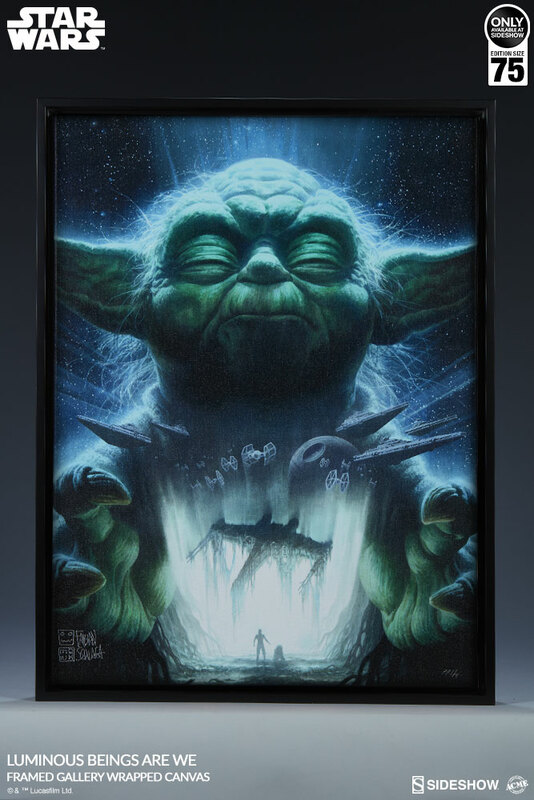 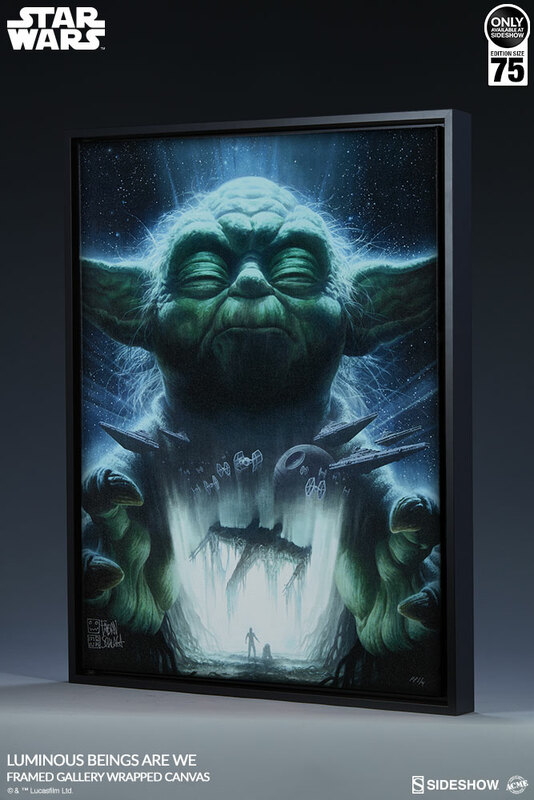 This gallery-wrapped canvas fine art print brings the Star Wars galaxy a little closer to home with this stunning and easy-to-display format. 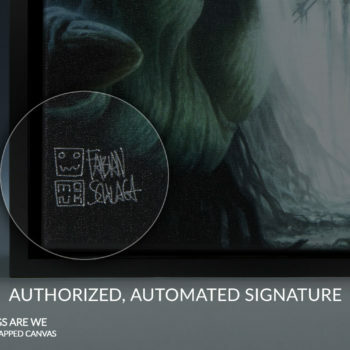 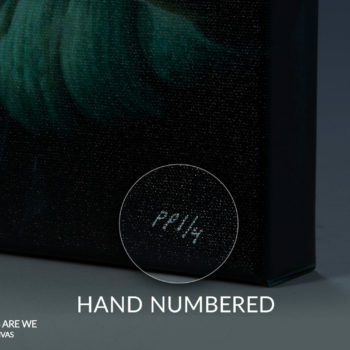 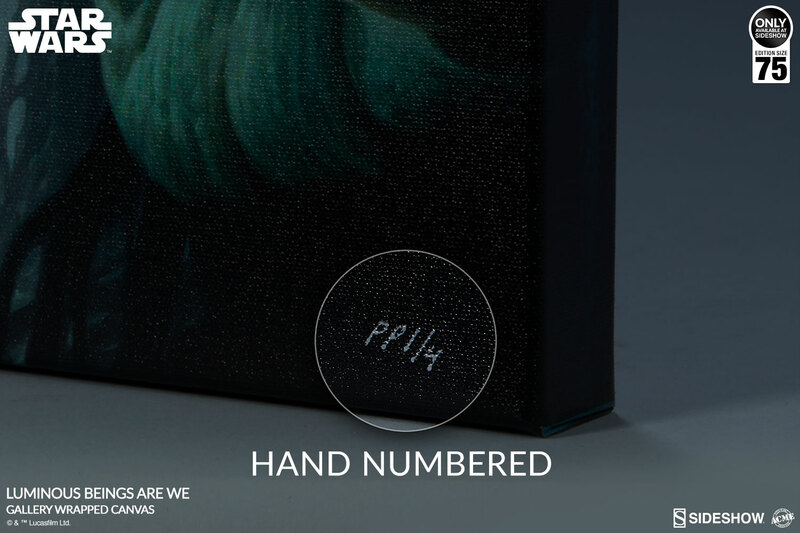 Each Luminous Beings Are We Gallery Wrapped Canvas features an authorized, automated pencil signature as well as a Certificate of Authenticity as a part of the highly- limited edition of 75 pieces. 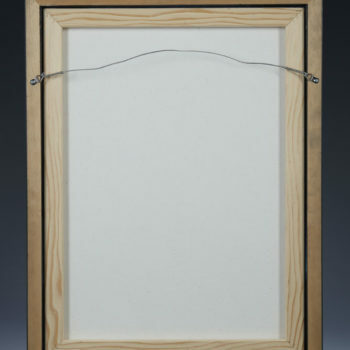 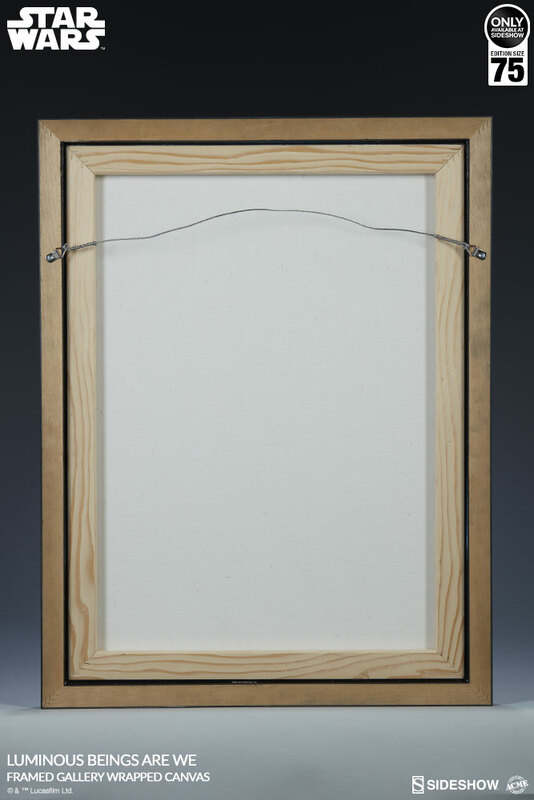 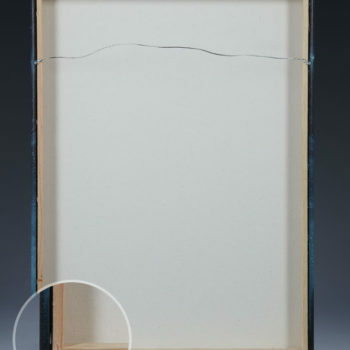 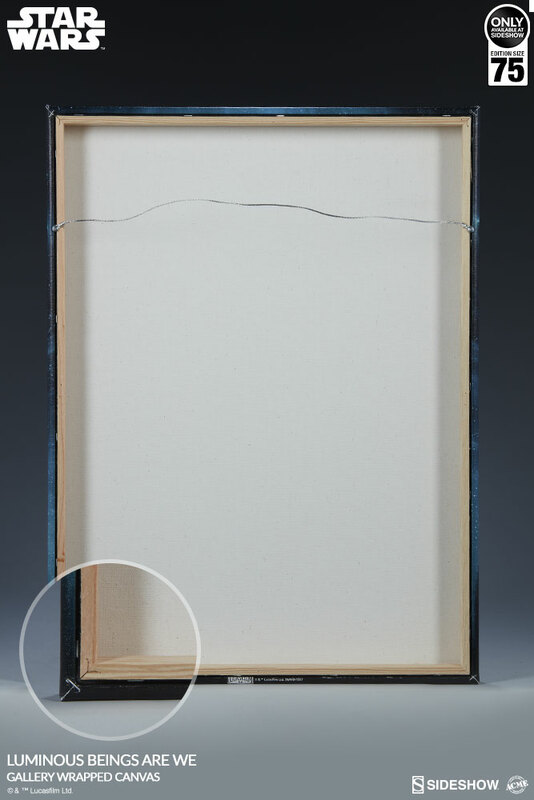 Each gallery-wrapped canvas comes ready for display complete with a wire hanger and a certified archival protective varnish, making this stylish fine art collectible ready for display. 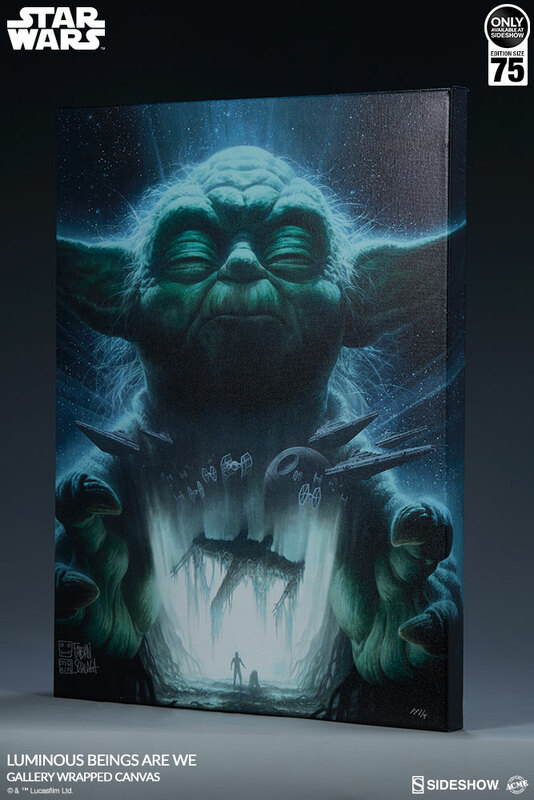 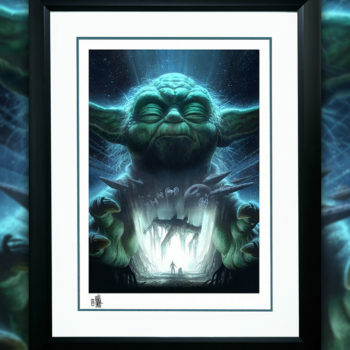 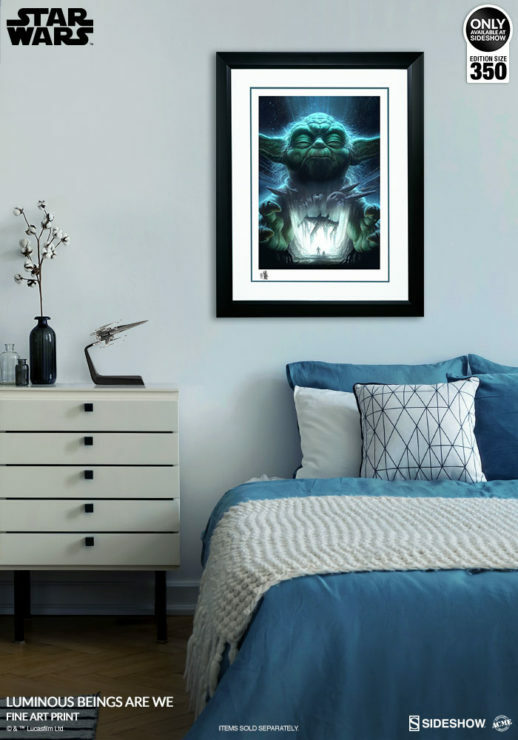 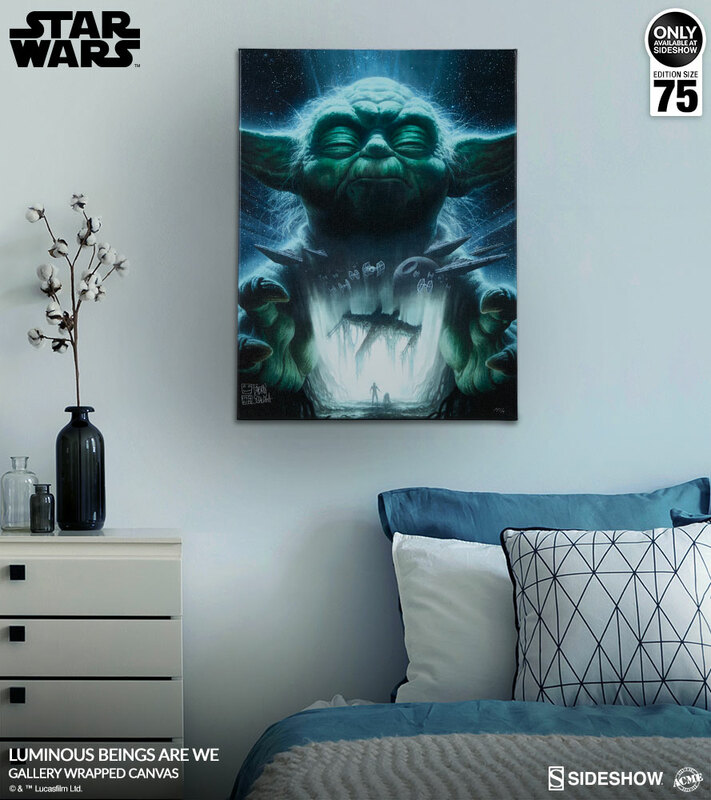 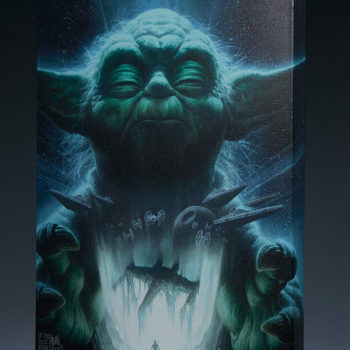 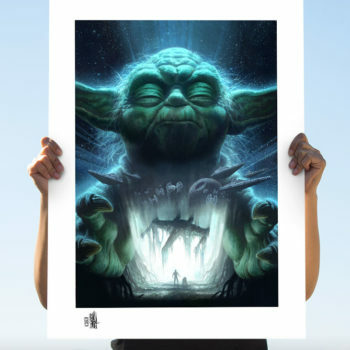 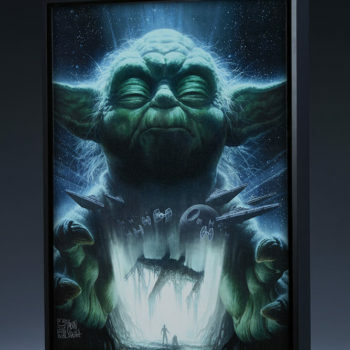 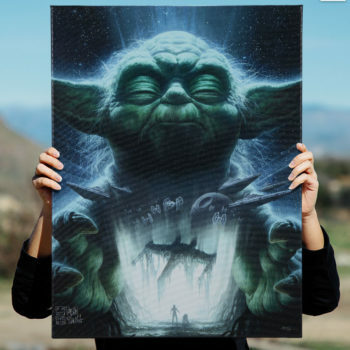 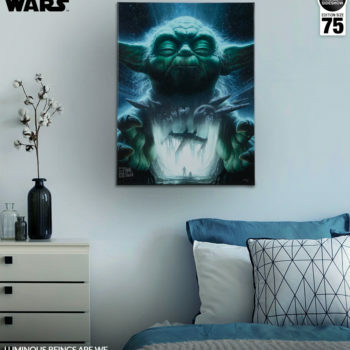 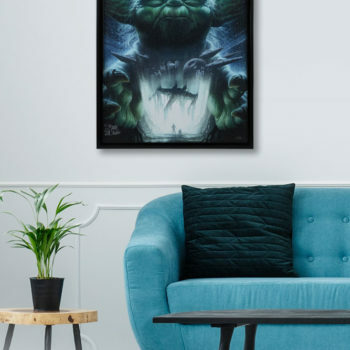 Make the Force your ally and add the Luminous Beings Are We Gallery Wrapped Canvas by Fabian Schlaga to your galaxy of Star Wars art collectibles today! 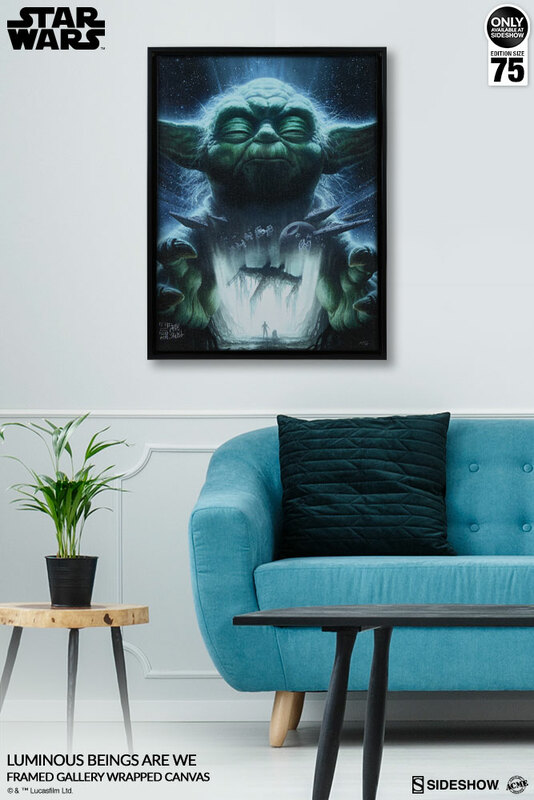 Pre-orders for the framed edition of the Luminous Beings Are We Gallery Wrapped Canvas will begin on Friday, February 8th between 12pm-3pm PST, and will be priced at $380 USD. 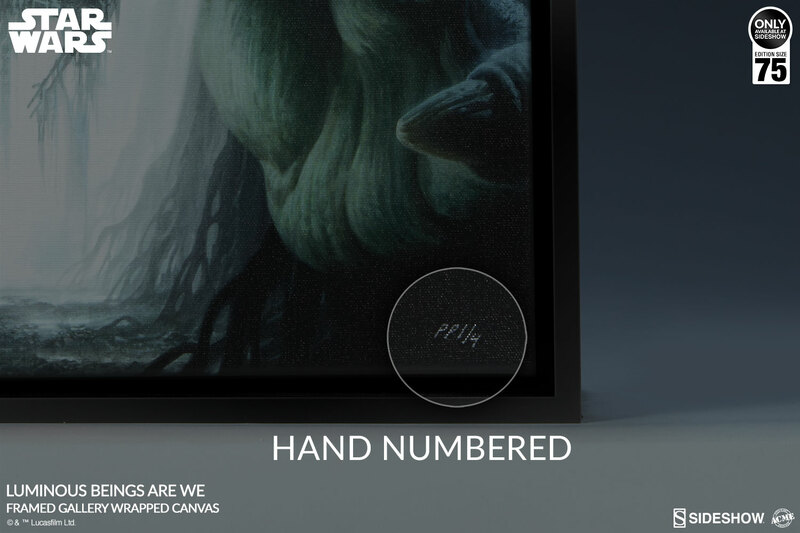 If supplies are available, unframed canvases will be available for pre-order on Monday, February 11th between 12pm-3PM PST, priced at $300 USD. 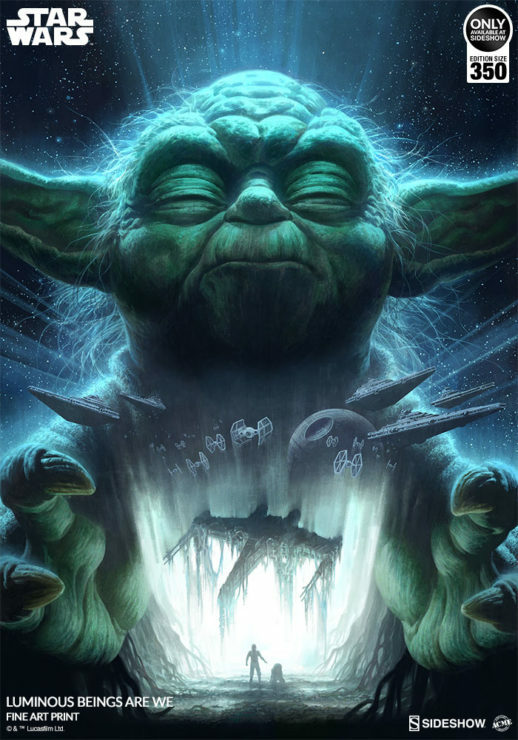 Legion Season 3 Casts Professor X, Netflix Developing Ninja Turtles Animated Film, and More!